two of her right-wing mentors. 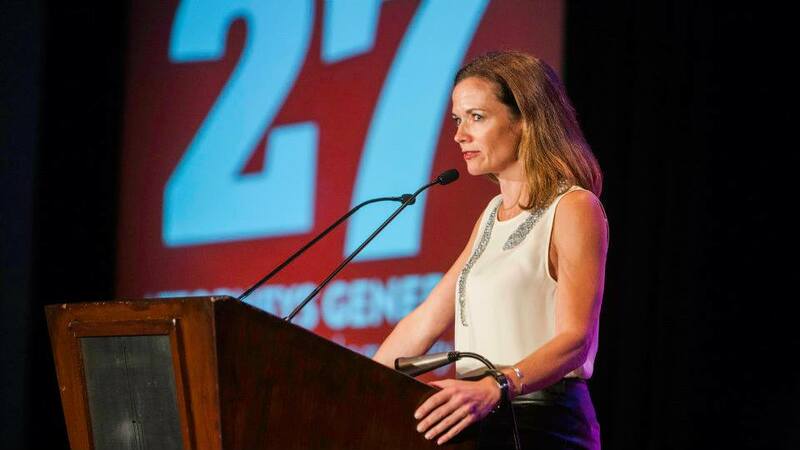 Republican political operative Jessica Medeiros Garrison tries to portray herself as a champion of women in a recent online rant against Legal Schnauzer. That notion is laughable to anyone who knows the first thing about Garrison's background. And in the course of her rant, as told to Liz Welch of marieclaire.com, Garrison winds up affirming some of the worst stereotypes women have had to fight for years. This is about more than just me. It's about the women who are bullied, trolled, and victimized online because someone has an agenda, or a chip on their shoulder, or a self-righteous feeling that they simply ​can​. Wow, that Jessica is quite a gal, standing up for imperiled women everywhere. But is her concern real? Not even close. Let's examine that first highlighted sentence for a moment. Garrison says her role is to encourage corporations to work with attorneys general. (Jessica has a little problem with grammar here; the plural is attorneys general, not attorney generals. You'd think a woman with a law degree, who had been appointed to a job in the Alabama AG's office and as executive director of an association of AGs, would know that.) 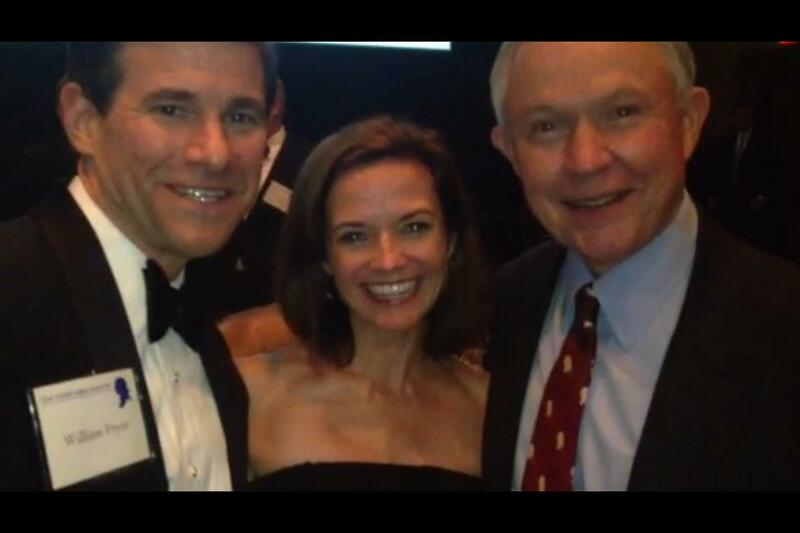 But Jessica says she represents only Republican AGs, so her line about promoting work with all AGs? Well, that's a lie. Even more troubling is this: The attorney general, in most jurisdictions, is defined as the chief law-enforcement officer and chief legal adviser to the state government. In other words, a big part of the job is to prosecute individuals, including corporate titans, who violate state laws. A state attorney general should be one of the last people corporate heads would want to work with. 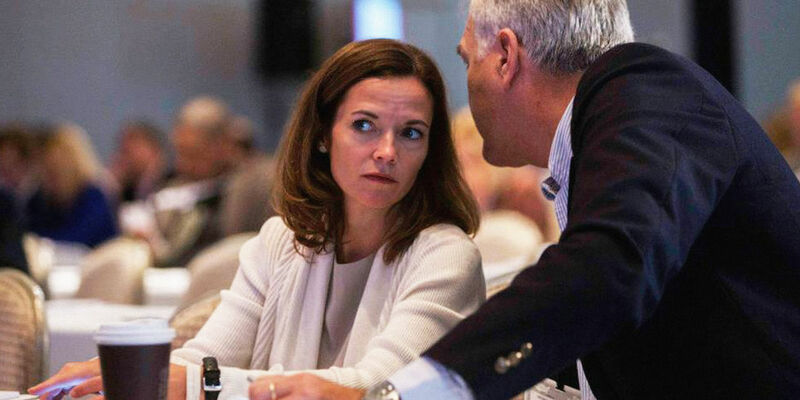 Unless, of course, Jessica's real job is to more or less conduct a "shakedown cruise" of corporate executives, assuring them that a contribution to RAGA will make it more likely that Republican AGs look the other way when said executives step in legal doo-doo. 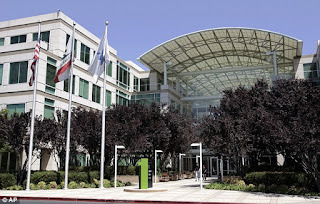 Was that the whole point of Garrison's visit to Apple in Cupertino, California? The Republican Attorneys General Association, created nearly 15 years ago, has grown in prominence as the number of Republicans holding the job has surged, reaching 25 as of this year. RAGA takes in millions of dollars a year from major corporations — companies that are seeking help to move their agendas or have been targets of investigations. Why would major corporations need help from attorneys general to "move their agendas"? I can see how they might need experts in advertising or public relations or lobbying. But an attorney general? I can't fathom a legitimate reason for a corporation to want the help of AGs to "move its agenda"--unless, of course, the corporation is up to no good and needs AGs to look the other way. Is Jessica Garrison a glorified "bag man" (or "bag gal") for conservative law-enforcement types? Here's a better question: Does anyone seriously think Jessica Garrison is a champion, of any sort, for women? She has publicly stated that her professional mentor is U.S. Circuit Judge Bill Pryor, a former Alabama Attorney General. Pryor might be one of the most virulent anti-woman political figures in modern American history. When President George W. Bush nominated Pryor to the federal bench in 2003, civil-rights and women's groups were so outraged that Bush was forced to make a recess appointment. Did Garrison help the cause of women with the shrill, high-anxiety tone of her Marie Claire piece? Given that women have had to fight the stereotype that they are prone to be nervous, hysterical, overwrought, and high strung . . . well, I would submit that the answer is no, she did not help the cause of women. In fact, she probably caused them to take several small steps backward. That's 12 high-intensity words or phrases in a relatively brief, 18-paragraph story. I think I need to take a Xanax after finishing it. Consider Garrison's tone, compared to the calm, professional demeanor of Hillary Rodham Clinton when she recently faced intense grilling about Benghazi before a committee of the U.S. House of Representatives. Who is the better role model for women? Heck, consider Garrison's self-centered tripe to the reporting I've done on real women--Sherry Carroll Rollins, Linda Upton, Angela Drees, Bonnie Cahalane--who have been abused by the Alabama justice system, Has Jessica Garrison ever taken a stand for such women? Has she ever taken a stand for any woman, other than herself--or maybe a sorority sister who is as self-absorbed as she is? In short, who is more the champion for women--Jessica Garrison or Legal Schnauzer? Under any reasonably objective examination, my record would trump hers eight days a week. Oh, and we mustn't forget this: Garrison's marieclaire.com article reveals her to be a hypocrite of Bunyanesque proportions. We've already noted this quality in Garrison on the subject of Big Tobacco. But now, her gross hypocrisy is on display regarding another major issue of the day. Video that went viral yesterday of a South Carolina sheriff's deputy body slamming and dragging a 16-year-old high school girl across a classroom floor probably was shocking to many Americans. But it was not shocking to my wife, Carol, and me. For us, it was like living September 9, 2015, again. That's the date a Greene County, Missouri, deputy shattered Carol's left arm during an unlawful eviction, one where officers had no lawful grounds to even be on our rented property. I saw everything the deputy did to Carol, from about 15 feet away, and it looked a lot like what you see on the video above from Spring Valley High School, near Columbia in Richland County, South Carolina. The good news is that Ben Fields, the South Carolina officer, was fired this morning, and he remains under federal investigation because Sheriff Leon Lott quickly sought assistance from the U.S. Department of Justice (DOJ). MoveOn.org has launched a petition, seeking to have Fields charged with assault--and we strongly support such action. The bad news is that we see no sign that anything has happened to the Missouri officer who brutalized Carol; we do not even know his name. We doubt that the DOJ or MoveOn.org even know about Carol's case. Our understanding is that Greene County Sheriff Jim Arnott is aware Carol's arm was broken, but no one from his department has contacted us or given any sign that the incident is being investigated. A Legal Schnauzer reader contacted Arnott and reported to me that the sheriff pretty much played dumb, acting like he knew nothing about the incident--even though he was standing about five feet away when Carol was assaulted. What was Arnott's immediate response to the assault? He lied, immediately proclaiming that Carol has assaulted the officer. A deputy drove Carol, in handcuffs, to the Greene County jail and told her she was facing a felony charge and a $100,000 bond. That only changed when Carol finally got someone to pay attention to her cries of severe pain in her arm--and X-rays immediately showed the break. The press in Springfield, Missouri, has shown no interest in covering the story--even though police brutality has been a national issue for more than a year. We've contacted several southwest Missouri law firms that supposedly specialize in police-misconduct cases, and they have either not responded or took our basic information and then quit responding. Translation: A cover-up seems to be under way in the Missouri Ozarks--of a police brutality case that might be about as bad any we've seen in the United States over the past 15 months or so, at least among those that did not involve a victim death. In cases where victims were injured, I'm not aware of many injuries that could be classified as more severe than Carol's. Ironically, the one exception that quickly comes to mind happened in Alabama--where a cop flipped a grandfather from India on his head, causing a spinal injury that might keep the victim from ever walking normally again. As for Carol's injury, we had a follow-up visit yesterday with her surgeon, and we received X-rays of her original injury, before she had received any treatment. The images almost make me vomit, and we will be sharing them here at Legal Schnauzer soon. Carol is going to need at least eight weeks of physical therapy (three times a week, probably), and one caregiver today said the best outcome might be a return to 75-percent usage of her arm. An earlier estimate had been 95 percent, but the latest word is that we are highly unlikely to achieve that. How do the South Carolina and Missouri cases compare? The Missouri deputy did not throw Carol backward on her head, as happened to the victim in the South Carolina case. But Carol was slammed to the ground, landing on her rear end hard enough that I still think she sustained a concussion. To my knowledge, she has not been examined for head trauma. Carol was not dragged across the ground, as happened to the South Carolina victim, but the cop jerked both of her arms in a backward and upward motion that was so severe one of her broken bones almost came through the skin. Our understanding is that the South Carolina victim managed to escape injury, and we are grateful for that. We also are pleased that the victim is seeing some measure of justice already--and we hope more is headed her way. For that, we suspect she can thank the classmates who used their cell phones to capture video of the assault and cause it to come to quick public attention. Without it, the South Carolina sheriff and his acolytes probably would be lying and covering up, just as we are seeing in Springfield. It's possible video exists in Carol's case; we aren't sure if any of the half dozen or so officers was wearing a body cam. If such video is out there, it's under control of Sheriff Jim Arnott--and his department in Greene County, Missouri, seems to be doing its best to cover up the brutality inflicted on Carol. Missouri deputy. 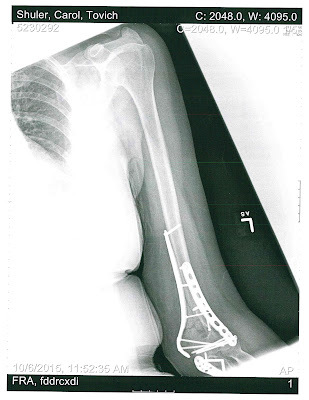 This image shows that titanium plates were required for a major portion of her upper arm, and more hardware was required for support below the elbow. Police brutality continues to be in the news, and one of the most disturbing recent cases comes from Virginia. 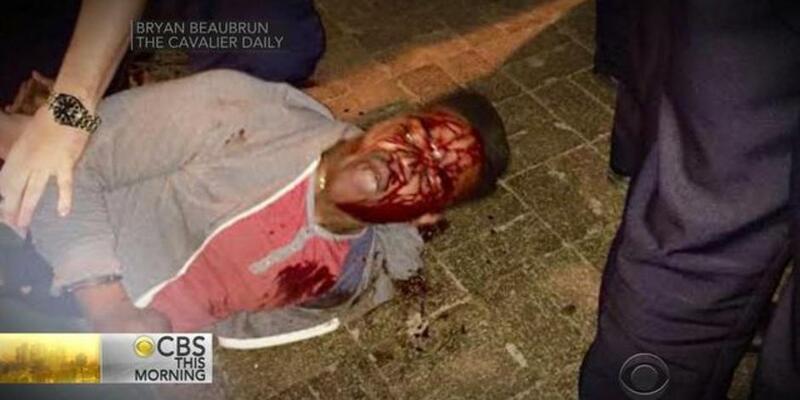 That's where University of Virginia honors student Martese Johnson was savagely beaten by agents from the state Alcohol Beverage and Control Department. Johnson has filed a $3-million lawsuit against agents who left him bloodied, with a gash in his head that required 10 stitches. It's hard to compare cases of police brutality for the horror they inflict on their victims. But a Missouri deputy left my wife, Carol Shuler, with a shattered left arm after an unlawful eviction at our apartment on September 9. Carol's arm was so badly broken that it required repair from Dr. Brian Buck, a trauma surgeon at Cox South Medical Center in Springfield, Missouri, and the University of Missouri. Caregivers have told Carol that a good result from such an extreme injury would be 95-percent use of her arm. In other words, it's unlikely that her left arm ever will be the same. X-rays we've posted tell you why. In one image, at least nine screws are visible, holding titanium plates that are allowing Carol's arm to heal. In another image, four to five lines that represent fractures clearly can be seen. The images in today's post show the kind of support Carol's arm needed, both well above the elbow and below it. Based on our conversations with caregivers, our guess is that indicates Carol's arm was not just broken--it also was dislocated, likely due to severe and brutal twisting. We intend to follow the Martese Johnson case and hope he and his family get justice. We intend to fight, with all of our might, so that Carol might achieve justice, also. Missouri deputy. 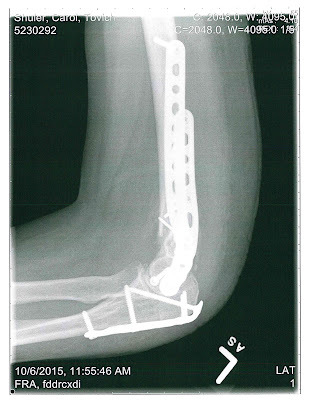 This image shows another view of the support Carol's arm needed from screws and plates below the elbow. Alabama's right-wing media types never fail to astound with their dishonesty and incompetence. 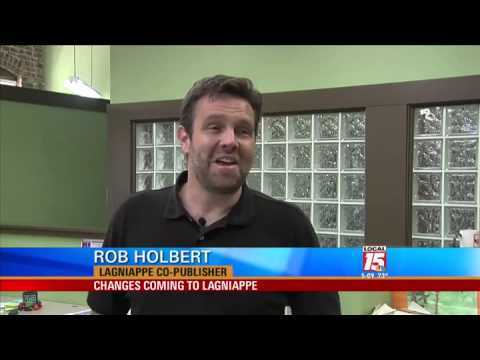 Take, for example, our "old pal" Rob Holbert, publisher of the Mobile-area weekly Lagniappe. When we last addressed the subject of Holbert, he was criticizing my reports about Governor Robert Bentley's affair with aide Rebekah Caldwell Mason, plus my outing of al.com journalist Charles J. Dean as a customer of the Ashley Madison extramarital-affair Web site. We showed that Holbert's commentary included so many errors that we didn't have enough fingers to count them all. 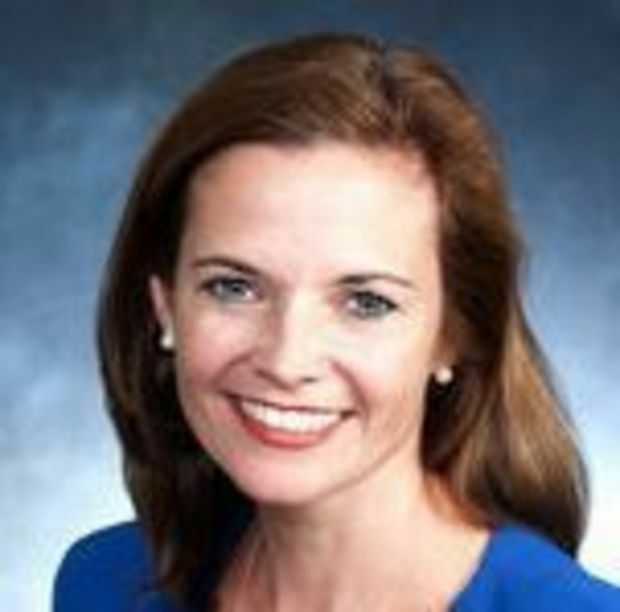 In an October 21 piece titled "Schnauzer target tells magazine his posts changed her life," Holbert takes on the Jessica Medeiros Garrison story, which grew from her as-told-to article at marieclaire.com, attacking my reporting on her extramarital affair with Alabama Attorney General Luther Strange. The headline of Holbert's piece has all sorts of grammatical problems, and the story itself reveals that the writer still struggles with accuracy and a tendency to make bizarre statements that seem to come from . . . well, right field, I guess. But for now, we will focus on his dishonesty. “Never have I reported that Luther Strange is the father of her child. In fact, I contacted Lee Garrison and interviewed him on the subject. He said he was convinced the child was his, and I never reported otherwise,” Shuler wrote last Friday in a scathing rebuke of the Marie Claire article. He didn’t explain why he would call the child’s father to discuss paternity if it wasn’t something he questioned. Shuler claimed Garrison’s article is full of inaccuracies and falsehoods, and reiterated claims her legal win against him came only “because I was not able to defend myself against her lawsuit, or bring a valid counterclaim” due to having been thrown in jail for five months for contempt in another defamation case, then finding his house in foreclosure due to other legal problems. When I emailed Shuler asking for comments on Garrison’s article, he referred me back to his website. Again, we see that Holbert actually has checked my blog post regarding Garrison, although he fails to mention specifics that I had laid out about the inaccuracies in the Garrison story. Still, we will give Holbert credit for doing at least a little homework. But then, note the highlighted section; he hints that I was dodging him, refusing to take questions, that I would let my blog post speak for itself and say nothing more. I was curious if you have any comments about the story? If you have specific questions, I would be glad to answer them. Probably would need to do that via phone. OK. I read your response. It answers any questions I currently have, but if I have more I'll let you know. As you can see, I did not simply refer Holbert to my blog. I specifically offered to answer any questions that he had and suggested we do that via phone. He told me my blog post answered all of his questions at the moment, and I never heard back from him. So why did he suggest that I was dodging him, that I was reluctant to talk about Garrison? I have no idea, but it suggests Holbert started his article with an agenda in mind--and the fact I was willing to take on questions about the Jessica Garrison case apparently did not fit that agenda. Garrison said Shuler even questioned the paternity of her son in print, an allegation he denies, although he has written about discussing the matter with Lee Garrison. He didn’t explain why he would call the child’s father to discuss paternity if it wasn’t something he questioned. * I didn't just deny questioning the paternity of her son in print; I invited anyone to conduct a search on my blog, and it will show that I've never reported that Attorney General Luther Strange is the father of Garrison's son. That is a verifiable fact, but Holbert apparently can't be bothered to verify it. * Holbert seems surprised that I would write about discussing the matter with Lee Garrison. That's what journalists do, they ask questions. Jessica Garrison told marieclaire.com that, at the time of my reporting, rumors were flying about her relationship with Luther Strange, and its possible fallout. To my knowledge, I'm the only journalist to have contacted Lee Garrison--a key source on the subject--and asked him about it directly. Why Holbert seems to find that odd is beyond me. * Finally, Holbert seems perplexed that I would question the parentage of Garrison's child, as if there is something improper about that. Never mind that Garrison acknowledges rumors were flying around the state about her relationship with Strange--they started long before I wrote about the subject, and they involved persistent questions about the father of her child, considering the timing of her divorce from Lee Garrison. As a journalist with a degree in the field and more than 30 years of professional experience--a fact Garrison and Holbert conveniently ignore--I don't just run with rumors. But when they seem serious enough, I do check them out--and that's what informed my reports about the Garrison/Strange affair--and I stand by those reports. That's also what drove me to contact Lee Garrison, and his answers to my questions convinced me that he is the child's biological father, and I never reported otherwise. Also, I should note that Lee Garrison, unlike his former wife, took questions on a sensitive subject and handled himself with considerable grace. As for accuracy, Holbert continues to struggle with it. For example, he writes, "[Shuler] claimed he was never legally served notice of the trial." Let me make this as clear as I can make it: There was no trial in the Garrison case, there was no pre-trial discovery, and there was no finding in an adversarial proceeding that my reporting was false or defamatory. In other words, neither Garrison nor Strange faced cross-examination about anything, they never sat for depositions, they never answered written interrogatories, they never turned over any pertinent documents (e-mails, texts, etc.). Jessica Garrison has proclaimed that she "won" her lawsuit, but that contention is based on . . . well, absolutely nothing, no contested record of any kind. Holbert doesn't even try to hide his bias on the matter. A reasonably objective journalist might refer to Garrison as the "subject" of my "reporting." Holbert and his Lagniappe crew refer to Garrison as a "target" of "online attacks." Garrison could not hire a PR firm--and she seems to have quite a nice expense account--to take a more one-sided approach than that. Our guy Holbert seems to have almost zero understanding of journalism, even though he holds the title of publisher at a weekly newspaper. He can't seem to grasp that my work never has been found false or defamatory in any trial or adversarial proceeding--and the public record at alacourt.com makes that clear. And yet, he portrays my posts as "online attacks." Here's one thing interesting about Holbert's piece: He manages to interview Garrison and lobs a few questions at her that would have to improve to reach the level of "softball." Meanwhile, I made it clear that I was happy to be interviewed, but he didn't bother with that. Holbert did manage to elicit a response or two from Garrison that contain a few kernels of truth, and we will address those in an upcoming post. Some folks probably think Lagniappe Mobile turns out journalism--and perhaps there are times when the weekly actually does that. But it's hard to expect much from an outfit led by a publisher who reveals himself as a partisan hack, one who is too lazy or incompetent to check the public record or interview a party who might actually bring Jessica Garrison's credibility into question. Alabama GOP operative Jessica Medeiros Garrison, in her recent public-relations assault against Legal Schnauzer, unwittingly admitted that her defamation lawsuit against this blog and me is based on a fraud. That raises the possibility that Garrison, and perhaps Attorney General Luther Strange, committed perjury in obtaining a $3.5-million default judgment against me. A person commits the crime of perjury in the first degree when in any official proceeding he swears falsely and his false statement is material to the proceeding in which it is made. Should Garrison, and maybe Strange, be referred to Jefferson County District Attorney Brandon Falls for a perjury investigation? Court documents in Jeffco Circuit Court show that Garrison clearly committed perjury. It's less clear exactly what Strange stated under oath, but given his status as our state's chief law-enforcement officer, the matter merits serious investigation. For now, let's follow the evidence trail, as we know it. The final straw was when Shuler wrote a follow-up post claiming my then five-year-old son was actually Luther's illegitimate child. I could handle the professional stuff—I have pretty thick skin—but this crossed a line. . . . I decided I had nothing more to lose—so I rolled up my sleeves and fought back. In other words, Garrison didn't decide to sue me until I wrote a follow-up post about the parentage of her son. One could reasonably conclude that her lawsuit was based almost entirely on that follow-up post about Luther Strange being the father of her child. For Garrison, there is a slight problem with all of that--I never wrote such a follow-up post. In fact, I never reported--at any time or any place--that Luther Strange was the father of her child. I invite readers who are interested to go to the search box at the top of this blog, key in "Jessica Medeiros Garrison and Luther Strange" (which should call up everything I've written about them), and see if there is any reporting about the parentage of Garrison's son. I can tell you the answer in advance: It's no. In his order awarding Garrison a $3.5-million default judgment, Jefferson County Circuit Judge Don Blankenship indicates Garrison testified falsely on this issue. Were her statements "material," as required by Alabama law? Well she has admitted they were the basis of her lawsuit, and Blankenship's order suggests they were the determining factor in the $3.5-million award. It's hard to get more "material" than that. The Court first heard testimony from the Plaintiff. She testified that the Defendant [me] had written, in a blog dubbed Legal Schnauzer, several misleading and inappropriate comments concerning her and Alabama Attorney General Luther Strange. The comments suggested that the Plaintiff received preferential treatment from the Attorney General because the two were engaged in an ongoing extramarital affair; and that the Attorney General was the father of the Plaintiff's minor son. Garrison's claim that I had reported that Strange was the father of her son was made in court, presumably under oath--and it is glaringly and indisputably material and false. That probably equals perjury. It certainly merits a criminal investigation. Do the people of Alabama have an interest in whether Jessica Garrison and Luther Strange committed perjury? Well, Strange's office is leading a long-running investigation of House Speaker Mike Hubbard, and its dubious raids have led to the closure of the VictoryLand casinio in Macon County. Strange's office has spent millions of taxpayer dollars on these investigations--and others; his honesty, or lack thereof, matters. Garrison served as Strange's campaign manager in 2010, and according to some reports, also helped in his 2014 re-election. She helped get him elected, so her honesty matters, too. The evidence is clear that Jessica Garrison lied under oath. We would say the odds are better than 50-50 that Luther Strange did the same thing. The public should demand a formal and objective inquiry. One day a month later, I was running late for a meeting with a close colleague when my lawyer called with the news: Not only had I won my case, but the judge had awarded me $3.5 million in damages. I ran into my meeting literally shouting, "I won! I won!" I was elated—not about the money, but about the fact that I'd seen justice done. Here's what she should have said in her meeting: "I won because I lied! I won because I lied! I lied under oath and got away with it! Isn't it great to be a Republican and an insider and a member of the elite? We can lie under oath and Win! Yeeeeeee . . . .! I suppose that might have reduced some of the elation in her meeting and raised questions about whether justice really was done--and we certainly would not have wanted that. reveals multiplefractures, probably four or five. Today marks the 26th wedding anniversary for Mrs. Schnauzer and me. As we prepare to "celebrate," Carol is recovering from a badly broken arm, courtesy of a Missouri deputy who, with a half dozen or so cohorts, was executing an unlawful eviction on September 9. (See X-ray No. 2 above.) Any "celebration" will come in or near a flea-bag motel in Springfield, Missouri, where we live on a week-to-week basis, now that lawyers and judges in two states (Alabama and Missouri) have helped steal just about everything we've ever worked for--including our home of 25 years in Birmingham. For good measure, my two brothers (Paul and David Shuler) have instigated a petition, which has zero basis in fact or law, that seeks to have Carol and me declared incompetent. Got to love that family support! As for the X-ray above, we showed you No. 1 yesterday, and this one is a slightly different view of the area that includes multiple fractures. 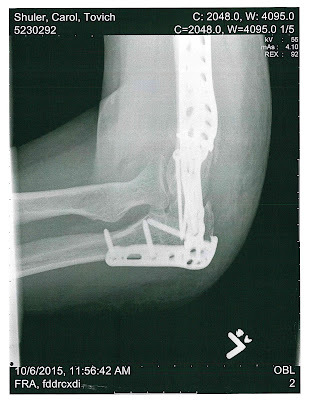 Just above Carol's elbow, you will notice that screws and titanium plates form a five-sided geometric figure. Inside that figure, you can see lines that represent fractures. The damage is so severe that Carol's caregivers have said a 95-percent recovery might be the best we can hope for. Do we actually have anything to celebrate today. I think we do; for one, we're still together--in mind, body, and spirit--so, in an age of starter marriages and rampant dysfunction in many homes, I consider that an accomplishment. If I'm going to have to experience a bunch of crap in life, I would rather experience it with Carol than anyone else. And when things are going well--although we might never get to such a state again--Carol is a fine companion then, too. I thought about staying away from the blogging gig on our anniversary, but the 26 years Carol and I have spent together inspired me to share a few thoughts on various marriage- and justice-related subjects. I hope you will find them worthwhile, so here it goes . . .
* Take those marriage vows seriously; they can be a bee-atch--If you are married in a traditional Christian ceremony, you likely will say vows that go something like this: "I, (Roger), take thee, (Carol), to be my wedded wife, to have and to hold, from this day forward, for better, for worse, for richer, for poorer, in sickness and in health," When the vows raise the specter of bad things that can happen in a marriage--"for worse," "for poorer," "in sickness"--they aren't joking. Carol and I have had a lot of good things--even wonderful things--happen during our 26 years of marital bliss. But we've had up-close-and-personal experiences with that "for worse" and "for poorer" stuff. In terms of sickness, we both have been diagnosed with PTSD, and that has very real repercussions. Otherwise, our general health seems remarkably good for all we've been through. When most of us think about those scary parts of the wedding vows--if we think of them at all--we tend to consider things like accidents, unavoidable health woes, mistakes, job loss for legitimate reasons, etc. In other words, it all comes under the heading of "s--t happens." But that's not necessarily the way it works in real life. Almost all of our negative experiences have intentionally been heaped upon us by bad people. We didn't lose our jobs (at UAB and Infinity Insurance) for legit reasons--political forces stole them from us. A word to the wise: If you are married, you likely will have a few things that you value, that generally are seen to have worth. If you have any such items, whether they be living beings or inanimate objects, there is always someone out there who would not mind stealing them. All of our legal problems started from a neighbor, with a significant criminal record and signs in his past that he has sociopathic tendencies, who wanted to (in essence) steal our yard. He wanted to use it without permission, and without paying for it and helping to care for it, and that's what I call stealing. Even if we are talking about real property, which can't be moved, bad people still can try to steal it from you--as this guy did, in part, by fencing in about 400 square feet that clearly belonged to us. * Stand for something, especially something that causes you to step outside your comfort zone--A friend of long standing recently scoffed at the notion that Carol and I should seek to be restored for all of the civil (and criminal) wrongs that have been committed against us. This fellow doesn't deny that we've been cheated in horrific ways, but his counsel is to just accept it and more or less "push the reset button." As for seeking restoration and justice via the court system, this fellow opines, "The system doesn't work that way." Some of you might be thinking, "I would tell that 'friend' to hit the highway and never come back." I'm starting to think along the same lines, but he did cause me to be extra grateful for the kind of woman I married. Critics are free to aim their arrows at Legal Schnauzer, and quite a few of them do, but no one can dispute that Carol and I have stood for something. I'm the author of the blog--and except for the five months when I was in jail, and Carol kept it alive--I am solely responsible for its content. But Carol signed off on this effort to expose corruption, when many spouses would have shied away. We've paid a heavy price for the journalism here, and we've attracted quite a few enemies. But have we made a difference? Ask some of the victims of injustice we've reported on--Don Siegelman, Sherry Carroll Rollins, Linda Upton, Richard Scrushy, Paul Minor, Bonnie Cahalane, Wes Teel, Dr. Mark Hayden, and many more. Their answers, I feel certain, would be yes. * Try to stand with someone who represents the goodness in mankind--Carol and I have our cynical moments, and there is no doubt that we now are very slow to trust anyone. And we certainly can get on each other's nerves from time to time. But I don't think we've allowed our unpleasant experiences to turn us into cynics. We still believe goodness exists out there. I've seen goodness in my wife for 26 years (28, if you count two years of dating). Consider our recent "eviction," the one that led to Carol's broken arm: When deputies allowed her into our apartment to retrieve some of our belongings, the first thing she made sure to get were the wooden urns that contain the ashes of our two late, beloved pets--Murphy, the miniature schnauzer for whom this blog is named, and Chloe, the beautiful Tonkinese kitty kat who died of cancer in July of this year. Carol has a number of inanimate objects that she values--her furniture, her jewelry, her clothes. But the first things on her mind, in a moment of crisis and terror, were Murphy and Chloe. In fact, Carol's arm was shattered because she was trying to return to the apartment to retrieve the litter box for our one surviving pet--Chloe's brother, Baxter. At a moment of extraordinary stress, when she had just been handcuffed and had multiple weapons pointed at her, Carol thought outside herself. Murphy, Chloe, and Baxter, technically, are not "of" Carol--they are not the "fruit of her loins." But she loved Murphy and Chloe dearly (and she loves Baxter dearly now), and they were the first beings who popped into her mind as she and I were facing homelessness--and, given all the weaponry, on the premises, possible execution. I had always hoped to marry a good-hearted person. And that's just the most recent proof that I did marry a good-hearted person. Even though we now live on the brink of ruin, I will always be grateful that I've been able to share the good and the bad with Carol. I might have a few more profound thoughts to share, but that's it for now. 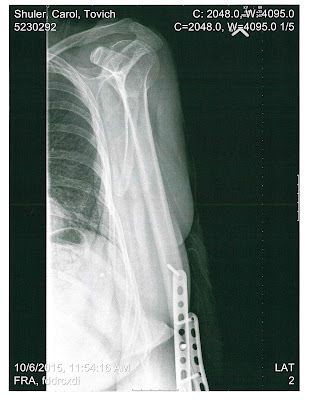 Back on the subject of X-rays, here is No. 3 below, which shows that Carol's arm needed support well above the elbow. We are guessing this is because her arm was dislocated, in addition to being broken. 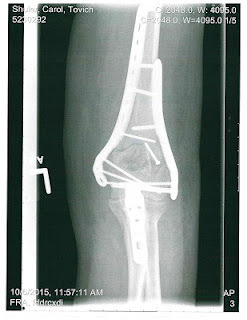 fractures, probably four or five. Since a Ferguson, Missouri, police officer fatally shot Michael Brown in August 2014, Americans have been inundated with stories about the victims of excessive force, police brutality, and other forms of law-enforcement misconduct. We are about to show you images of the physical wreckage thug cops can leave behind--and we will do it in a dramatic form that I do not believe has been used at any other news site. Ironically, this also involves a Missouri style of police brutality, in Springfield (Greene County), in the southwest corner of the state. That's where some half dozen deputies from the Greene County Sheriff's Department, including Sheriff Jim Arnott himself, conducted an unlawful eviction on September 9 that played out like an orchestrated terror attack. My wife, Carol, and I had at least one assault rifle aimed at us, along with five or six handguns. We both were handcuffed, even though we were not alleged to have committed any crime, and the eviction itself was unlawfully scheduled during the 10-day post-judgment window when no such action can take place under Missouri law. On top of that, we had filed a Notice of Appeal and timely served attorneys for all parties, putting an automatic stay on the eviction. In other words, deputies had no lawful grounds to be on our rented property on September 9. But a veritable SWAT team invaded our residence anyway, and in the ensuing chaos, Carol's left arm was so badly broken that it required the expertise of Dr. Brian Buck, a trauma surgeon from Cox South Hospital in Springfield (and the University of Missouri) to piece it back together. Carol's caregivers have told her that the goal with such a serious break is to restore her arm to 95 percent use--and that would be a best-case scenario. The chances that her arm will return to normal appear slim. What did Carol's arm look like immediately after a Greene County deputy had slammed her to the ground and twisted both of her arms behind her--all because she was trying to retrieve our cat's litter box? I can't provide an exact answer to that question because I have not seen those X-rays. I have seen that her right arm (the one not broken) was purple over more than half its surface from bruising. And Carol has told me that, in the hours immediately after the assault by cops, her left arm was almost black from the elbow up, with a large bump where at least one bone apparently was close to breaking through the skin. We can, however, show you exactly what her arm looks like now--on the inside--with all of the hardware required to repair the damage. During a followup visit on October 8, Dr. Buck's staff took several X-rays and gave us copies. Carol's recovery seems to be going about as well as we could hope. 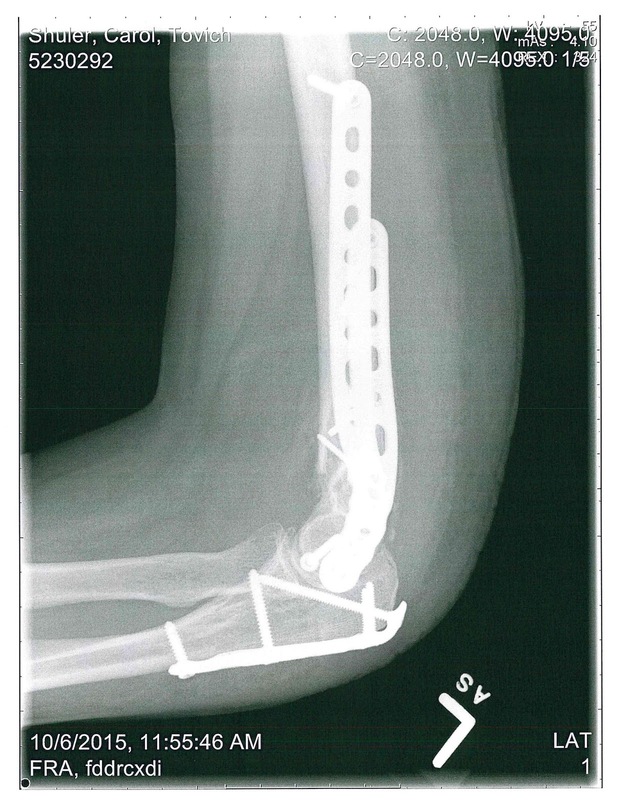 But the X-rays--even after surgery--give an idea of the kind of damage with which Dr. Buck and his team were faced. And they reflect the brutality with which an officer, who has the duty to "protect and serve," treated a 55-year-old woman who simply was trying to make sure our cat had a place to use the bathroom as the three of us stared homelessness in the face. I don't have the medical expertise to provide a detailed commentary on the image above--and on the images that will be featured in upcoming posts.. But I don't think it will be hard for you to see the damage for yourself. When Carol asked Dr. Buck exactly how many places her arm had been broken, his answer was "enough." One of his assistants looked at one of the X-rays and pointed to four or five lines that represented fractures. In the image at the beginning of this post, most of the fractures are to the left of what appears to be a loose screw, with its point heading upward at a slight right-to-left angle. The screw, of course, is not loose; it's one of at least nine screws you can see on this image to hold Carol's shattered bone in place. But the "loose screw" is a good reference point because much of the damages--apparently four or five fractures--are just to its left. You can see the damage even more clearly on an image for an upcoming post. How long does it take for Jessica Medeiros Garrison's public-relations assault on Legal Schnauzer to show that it has a disconnect with the truth? The answer is one paragraph--specifically, three sentences. We've already shown that Garrison's claim that I stalked her is laughably untrue--in fact, Garrison presents zero evidence that I've ever been anywhere near her house and admits that on one occasion she was convinced a boogeyman (me, I guess) was outside only to discover it was cops doing a drive by. Her assertion that I reported Alabama Attorney General Luther Strange is the father of her child can be proven false with a simple search on my blog. You have to read down into the Garrison piece a ways to discover the stalking and "Lutha as baby daddy" fables. But the nuttiness starts right at the top. Consider the lead on Garrison's piece, which was told to a marieclaire.com writer named Liz Welch, who apparently is incapable of asking a few questions to determine if anything Garrison says is true. Ms. Welch also must not have been capable of sending me an e-mail or calling me and allowing me to respond to Garrison's wacky tales. ​My saga started in July 2013. A friend texted me, asking, "Do you know this guy, Roger Shuler?" I didn't, but quickly learned he was the political blogger behind the website Legal Schnauzer and author of a new post that would forever change my life: "AG Luther Strange Has a Messy Extra-Marital Affair with Ex-Campaign Aide Jessica Garrison." A reasonable assumption here seems to be that the friend was not asking if Garrison knew me personally; the question seems to be: Did she know of me? And Garrison's answer was no. Well, I've got evidence to show this is false. It appears the friend's inquiry was triggered by my first post about Garrison's affair with Luther Strange, and that post was dated July 17, 2013. Garrison gives the impression that she was baffled as to who I was or what I was working on. But e-mail records show she had every reason to know who I was and why I had contacted here. That's because I sent her an e-mail on July 12, 2013, informing her of my investigation on the alleged affair and asking for an interview on the topic. I am a journalist in Birmingham, reporting on justice/legal issues at a number of Web sites, including the blog Legal Schnauzer. I've received reports from multiple sources that you and Luther Strange had an affair that culminated with your divorce and his election as attorney general of Alabama. I have been researching this matter for several months, and I'm at the point where the stories are ready for publication. I would like to give you an opportunity to respond to questions and ask that we schedule a time for an interview, either via phone or in person. My plan is to begin running the articles in the next few days, so I ask that you respond to this request by 5 p.m. on Tuesday, July 16. Roughly five days before the inquiry from her friend, Garrison knew exactly who I was and why I was contacting her. So Garrison either has a horrifically bad memory--in which case, marieclaire.com should not be running her story--or she is lying. Garrison chose not to respond to my interview request, and it's her right to do that. But you will notice that she had every opportunity, before publication, to state that the affair story was inaccurate and answer questions on the subject. But it wasn't until a couple of months later that she chose to file a lawsuit, publicly proclaiming the affair story to be false and defamatory--when she earlier had passed on an opportunity to make pretty much the same declaration. The careful reader--for example, one who has followed the Garrison/Strange story here at Legal Schnauzer--has every reason to doubt Garrison's veracity from the opening lines of the Marie Claire article. In terms of accurate reporting, the story only goes downhill from there. Alabama Republican operative Jessica Medeiros Garrison has launched a public-relations offensive against Legal Schnauzer, connected to the $3.5-million default judgment entered against me in a defamation case she brought. The original Garrison story, which appeared yesterday at a Web site called marieclaire.com, is filled with false statements from Garrison--including at least one that probably rises to the level of defamation. The Garrison article is more or less in first-person form, as told to someone named Liz Welch. Did Ms. Welch bother to actually question Garrison about any of her statements? Sure doesn't look like it. Al.com, the largest news organization in the state, picked up on the marieclaire.com piece today, and reporter Leada Gore proceeded to mangle the simplest facts about the case. For good measure, the right-wing site Yellowhammer News ran the original piece verbatim, repeating all of the false statements it contains. Did any of the "journalists" involved contact me for comment--or question me about key legal and factual issues that they got wrong? Nope. Did any of them check the court file, which is public record and easily available at alacourt.com? They clearly did not. The story in question involved allegations that Garrison had an affair with Alabama Attorney General Luther Strange, for whom she was campaign manager in 2010 and (according to some press reports) in 2014. Did any of the "journalists" involved in the latest Garrison coverage point out that my reporting never has been found false or defamatory before a jury? Did they report that Jessica Garrison, in her original filings, did not even seek a jury trial--and her lawyer, Bill Baxley, only asked for one after I had demanded one in my answer to her complaint? Did the "reporters" note that my posts never have been found false or defamatory in any adversarial proceeding in a court of law? Have Garrison or Strange ever sat for cross examination under oath, such as in a deposition, or have they ever turned over documents (emails, text messages, phone records, etc.) related to their relationship? Have Garrison or Strange ever volunteered to unseal records from her divorce case in Tuscaloosa County, where she once was married to school-board member Lee Garrison? The answer to all of those questions are no. And none of the reporters wrote that I was the victim of a default judgment only because I was unlawfully thrown in jail for five months and then got out to find our home of 25 years going into a foreclosure that smells to high heaven. The foreclosure almost certainly was wrongful, and no one benefited from it more than Jessica Garrison--because I was not able to defend myself against her lawsuit, or bring a valid counterclaim. Did any reporter question Jessica Garrison about her knowledge of my incarceration and the foreclosure? No. The final straw was when Shuler wrote a follow-up post claiming my then five-year-old son was actually Luther's illegitimate child. I could handle the professional stuff—I have pretty thick skin—but this crossed a line. It upset his father, my ex-husband, who sent Shuler a comment to set the record straight, which of course he never posted. There is a slight problem with this statement from Garrison--it isn't true. I never reported that Luther Strange was the father of her child. Anyone can go to Legal Schnauzer, go to the search box at the top of the page and key in "Jessica Garrison and Luther Strange," and review every post I've written on the subject. Never have I reported that Luther Strange is the father of her child. In fact, I contacted Lee Garrison and interviewed him on the subject. He said he was convinced the child was his, and I never reported otherwise. I have that interview on tape and will be running it shortly. I'm not aware of Lee Garrison ever sending me a comment. If he did, he certainly did not identify it as being from him. And there was no reason for him to "set the record straight" regarding his son's parentage because I never reported anything about Luther Strange fathering the child. There is no second place in politics—you either win or you lose—and this ridiculous little blog was being used as a tool to try to gain a competitive advantage. I was livid. Shuler posted photos of my home on his website, which felt like a threat, not to mention a huge violation of privacy. Had he been at my house? Was he stalking me? I installed a home security system and put the police on notice. I was so paranoid that I called the cops in tears one night, convinced someone was outside, and was relieved—and slightly mortified—to learn it was the police doing a drive by. Garrison implies that I was stalking her, but she fails to mention that the home in question was subject to a foreclosure, and documents related to that proceeding are public record. Also, the home apparently had recently been on the market, and the photos in question came . . . right off the Web. I also ran a photo of her and Luther Strange, which might have been taken in her yard--I don't know. But I do know the photo came straight from . . . Garrison's own Facebook page. For the record, the only time I've ever seen Jessica Garrison was in a courtroom. I only wrote about her home because public records suggest she got an extraordinarily good deal on a house in one of the Birmingham area's most desirable neighborhoods--the Crestline section of Mountain Brook, and the location of her home was a significant factor in a child-custody case that grew from her divorce. Do I now have a defamation case against Jessica Garrison? I'm not sure; that question will require some research. But I do know that the law, in general, frowns on making "imputations" that someone has committed a crime that they have not committed. And stalking, last time I checked, is a crime. 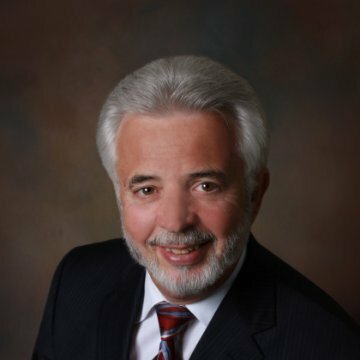 In April, a Shelby County judge entered a default judgment against blogger Roger Shuler and his website Legal Schnauzer, ordering him to pay $3.5 million in damages to a former campaign manager for Attorney Gen. Luther Strange. Again, we have a little problem. The Garrison case was in Jefferson County court, not Shelby County. Nothing like screwing up your story--and ruining your credibility--in the very first paragraph. We can excuse, Ms. Gore, because her error is in keeping with the whole Garrison public-relations charade. The original marieclaire.com article reads like it was written by the cast from Fantasy Island. So we probably shouldn't expect much from any of the followups. An assault by Missouri deputies that left my wife with a shattered left arm likely is the latest attack on independent, Web-based journalism, the kind that establishment forces such as lawyers, judges, law enforcement, and corporate elites cannot control. Specifically, it's a sign of ongoing blow back we have experienced for my coverage of the Don Siegelman case. Those are two conclusions from Joan Brunwasser's new interview with me, "Truth-telling journalist evicted, wife assaulted by heavily armed deputies," at OpEd News. Brunwasser is based in Chicago, but she long has reported on political and legal corruption in Alabama, which I have called "Ground Zero" for deterioration of our justice system that started during the George W. Bush administration and largely has continued unabated under Barack Obama. OpEd News is ranked among the top 100 political blogs on the Web. My wife, Carol, has had her stitches removed after trauma surgery to repair her arm. But she now must wear a compression garment, and her arm is filled with enough screws and titanium to build Tiger Woods a new set of golf clubs. Caregivers have said the goal is to get function in her arm back to 95 percent. While Carol's recovery is going well, it appears unlikely she will regain full and normal use of her arm. JB: You've had a pretty eventful life of late. Would you care to catch us up on what's been happening? RS: Your readers probably remember that I was incarcerated in Alabama for five months (October 2013 to March 2014)--for daring to practice journalism--and my wife, Carol, and I lost our house in Birmingham to a foreclosure that I now am convinced was unlawful. After all that trauma in the South, we fled to Springfield, Missouri, where I grew up and still have family. But it seems the conservative forces that want to shut down my reporting on the blog Legal Schnauzer have followed us, perhaps through my brother David, who happens to be a right-leaning lawyer in Springfield. On Sept. 9, we were unlawfully evicted from our apartment in Springfield. Sheriff deputies (about seven or eight of them) burst through the door, trained at least one assault rifle and multiple handguns on us, handcuffed us both, and ultimately assaulted Carol, breaking her arm. A trauma surgeon used all sorts of screws and titanium plates to piece her arm back together. Her recovery seems to be going well, but she's a long way from "back to normal." In fact, we are concerned that her arm might never be the same. JB: I'm really sorry to hear about the assault and Carol's resultant injuries. Is this the normal course of things for an eviction, Roger? It sounds more like you were on the Most Wanted List, based on the law officers' behavior. And why were you being evicted in the first place? I'd like some more details to sink my teeth into, please. RS: I've never been involved in an eviction, Joan, so I don't know for sure about the normal course of these things. But I understand it's common for a deputy or two to be on hand and play a relatively passive role while the landlord's crew removes items from the property. In our case, I don't know why we were targeted for eviction. Our rent had been timely paid, and we had been model tenants. 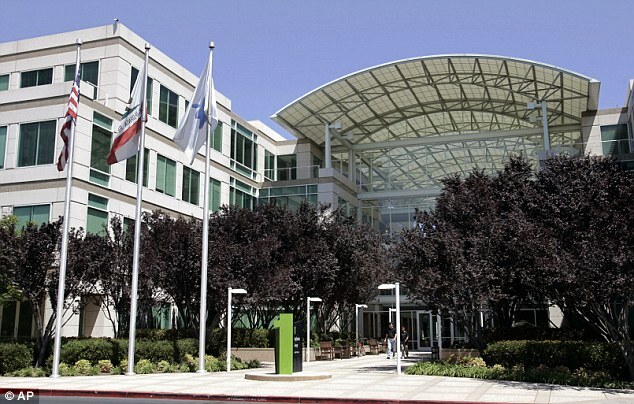 According to the lease, we were to go on a month-to-month basis after the first 13 months. That's what we thought would happen, but we had a notice to vacate taped to our door on July 2. When I called to see what was going on, the landlord's representative told me that we were being ousted under grounds that violated the lease. We fought the vacation notice in court, but as I've seen happen repeatedly with judges in Alabama, the Missouri judge seemed to pay little attention to the facts or law and ruled against us. Under Missouri law, there is a 10-day window where execution on an order (such as an eviction) cannot be carried out (levied is the term used in the law). The eviction was scheduled for Sept. 9, which was inside the 10-day window, so it was unlawful on those grounds. On top of that, we filed a Notice of Appeal on Sept. 8, and by law, that puts a stay on the eviction. But the eviction happened anyway, and judging by the behavior of deputies (who included Greene County Sheriff Jim Arnott), you would think we were running a high-level drug-smuggling operation. In the ensuing chaos, Carol and I were handcuffed, and a deputy pounced on her and slammed her to the ground, breaking her arm, when she tried to enter our apartment (as she had been given permission to do) to retrieve our cat's litter box. JB: I believe the law officers accused Carol of attacking them. What really happened? RS: Jim Arnott, the sheriff himself pointed at Carol, as her arm had just been broken in four or more places, and said, "She assaulted a police officer." I didn't know whether to guffaw or blow my stack. I saw the whole thing from the driver's seat of our car. I heard Carol say, "I'm just trying to get . . . ", and then I saw her being slammed to the ground, and one officer grabbed both of her arms and jerked them in an outward and upward motion, before putting handcuffs on her. Carol is 55 years old, very feminine (she's hardly Rhonda Rousey) [editor's note: RR is current UFC Women's Bantamweight Champion] and I've never seen her do anything remotely violent in the 28 years I've known her. We're about to "celebrate" our 26th wedding anniversary, with her arm in a compression garment. This is a blatant example of the kinds of lies law-enforcement officers will tell when they know they are in the wrong. We saw it on video with the Sandra Bland case in Texas. Facebook is filled with images and videos of cops abusing citizens--and in this case, officers had no lawful grounds to be on the property at all. JB: Wow. That's brave, some would say foolish. Kudos to you and Carol! How can people help? RS: Well, the latest is that my two brothers--David, a lawyer, and Paul, a radiology tech at Mercy Hospital, both in Springfield, MO--have filed court documents to have Carol and me declared incapacitated and disabled, with a guardian or conservator appointed for us. I'm just beginning to learn the law on this, but it sounds like we could lose many of our rights--right to vote, right to take care of our own finances (such as they are), right to make our own medical decisions, even the right to bring a lawsuit. I think that last one is the real reason this court case has been filed--someone wants to prevent a lawsuit because of Carol's injuries, theft of our property, etc. It also sounds like it could be a first step toward having us physically committed. I guess that's what we do now to journalists who report on uncomfortable truths--first jail, now this? I reported on this latest development at Legal Schnauzer in a post dated Oct. 7, 2015. It sounds wacky, I know, but it's the latest thing we are dealing with. 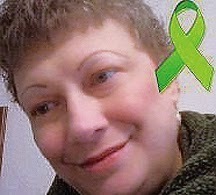 As for ways to help, we could use financial support, for sure. Donations are the main way we have of keeping my reporting going, so any help is very much needed and would be greatly appreciated. JB: How very Kafkaesque. Your brothers sound like two scary dudes. On a more positive note, how would someone make a donation? Give us everything we need in order to help. RS: I'm not sure my brothers are scary, Joan, but I do think they are misguided--and perhaps they've been influenced by some corrupt forces from Down South. Probably the best way to donate is to go to the Legal Schnauzer blog and click on the donate button in the upper right-hand corner of the front page. That's connected to our PayPal account, and there are several payment options. Again, any support is greatly appreciated. JB: I thought we were done but something else occurred to me, Roger. Your blogging activities since 2007 have seemingly gotten you in trouble. Unlike the mainstream/corporate press, you spent a lot of time and energy covering the Don Siegelman* case. So, do you think that, at bottom, this all started with Siegelman and the attempt by the powers that be to shut you up? RS: Oh, there is no doubt the answer to that question is yes, Joan. Here is a link to one of several posts I've written that provide evidence showing I was fired from my job as an editor at the University of Alabama at Birmingham (UAB, where I had worked for 20 years) because of my reporting on the Siegelman case. Near the end of the post is a partial transcript of a conversation I had with a UAB human-resources exec named Anita Bonasera. This conversation took place after I had been put on administrative leave for allegedly writing my blog at work but before I was fired --UAB's own IT expert, who monitored my work computer for 4-5 weeks, later testified at a grievance hearing that I never touched the first keystroke on my blog while at work. Bonasera states that my supervisor, Pam Powell, went to UAB IT to check on my computer usage, and the following exchange takes place. Bonasera is AB, and I'm RS. RS: Well, you just said it, it's all about my blog. You just said that. At the end of that blog post, with the link above, is a video where your listeners can listen to a tape recording of the actual conversation. (2) My supervisor specifically was looking for anything I might look at on my computer regarding the Siegelman case--even though it was the biggest news story in Alabama at the time (and we were supposed to keep up with Alabama news stories), Siegelman, as governor, was a former member of our board of trustees, and Siegelman's codefendant, Richard Scrushy, was and probably still is the most well known UAB alumnus in school history. Here's what it boils down to: The concern about my Siegelman coverage, I'm convinced, was that, back in 2007-08, I was showing that U.S. Judge Mark Fuller had acted corruptly in the case. And Fuller had been hand-picked by Karl Rove and other Bush types to make sure Siegelman got convicted for a "crime" that doesn't even exist under U.S. law. Some 7-8 years later, the entire country knows Mark Fuller was corrupt and unfit for the bench now that he's been forced to resign after being charged with beating his wife. My reporting was both accurate and way ahead of its time, but it made the regime of GOP Governor and prime Siegelman opponent Bob Riley uncomfortable, and they caused me to be cheated out of my job. I have zero doubt that Bob Riley's son, Birmingham lawyer Rob Riley, who later filed the lawsuit that led to my unconstitutional imprisonment, played a major role in getting me fired. I lost my job in May 2008, and in October 2009, Carol lost her job at Infinity Insurance in Birmingham under bizarre circumstances. I feel certain that Riley forces also were behind that, and the job loss largely is the reason we now find ourselves barely above homelessness. Sorry for the long answer, but your question goes straight to the heart of our situation. That someone saw fit to mess around behind our backs with our jobs is what led to much of what we discussed earlier. JB: It's good to have the background so our readers can get the context. Pretty sordid. So, it's not out of line to ask at this point, what's in store for other intrepid journalists who rock the boat by actually doing their jobs? RS: It's hard to say, Joan. Alabama is a unique animal, or at least I hope it is. One problem is that journalists tend not to stick together these days--and that's probably been the case for years. Consider the case of the late Gary Webb, who broke the story at a San Jose newspaper of the CIA and Bush I admin being involved in drug smuggling to inner cities. He was crucified by the NY Times, LA Times, WaPo and other establishment papers. We now know that his reporting, for the most part, was right on target, and there is a fairly current movie about him called Kill the Messenger. Ironically, the NY Times did an inaccurate and very poorly reported story on my incarceration. I find that, if a story originates at a blog, web site or some form of nontraditional press, the mainstreamers want no part of it--jealousy, maybe? We need both responsible, fearless journalism and a strong, relentless Justice Department to attack the widespread problems in our courts. And citizens need to care, even if they personally have not been cheated by corrupt judges or lawyers. All of us send taxpayer dollars to support this system that is broken and needs major repair. We all have an investment in it, and it simply does not dispense anything close to what might be called justice. The rule of law means nothing to many people who have law degrees. JB: I wish I could disagree with anything you've said here. Anything you'd like to add before we wrap this up? RS: Our justice system is failing us. It became obvious during the Bush II administration, and the Obama administration has done almost nothing to fix it. In my view, most of the corruption initiates with Republicans or conservative Democrats, but Democrats of all stripes have been enablers. We're talking here about basic constitutional protections--due process of law, equal protection, rule of law--the very things that are supposed to make us America. They are rotting right under our noses, and before long, we're going to have a country that we don't recognize. The legal profession has proven that it cannot be entrusted with our justice apparatus. We somehow must get regular citizens involved in an oversight capacity. Lawyers overseeing lawyers simply does not work--no more than foxes guarding henhouses, to borrow a phrase from my rural roots. I would encourage your readers to pay attention to the various presidential debates and see if they ever hear a question or comment about corruption in our justice system and the overwhelming need for reform. I've yet to hear a single Republican candidate mention it. And I would be shocked if Hillary Clinton, Bernie Sanders, Joe Biden, or any other Dem raises it. 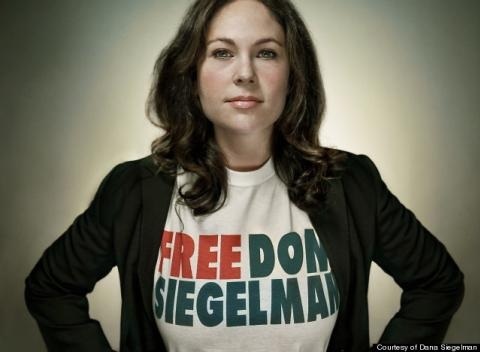 Don Siegelman can only be described as a political prisoner, but it seems our citizens and our candidates are willing to accept that as part of our postmodern American democracy. I refuse to accept it. And I think most of my fellow citizens would refuse to accept if they took the time to educate themselves and understand just how badly the system betrays all of us. For those who think this doesn't affect them, here's a thought: If you live in America, you almost certainly will be in court someday--over a divorce, an estate, a car wreck, a property matter, an insurance matter. No matter how hard you try to avoid it, court is almost certainly going to beckon you one day. When that day comes, you will want to make sure the judge and lawyers you face act in an ethical manner. But too many of them now are unethical, and if something isn't done about it, you will be victimized down the road. Do my brothers in Missouri have a legitimate case for trying to have my wife, Carol, and me declared incapacitated and disabled? Is the court-appointed attorney assigned to Carol and me actually representing our best interests? The answer to both questions is "not even close." In fact, we have come to see the Republican presidential primary race often described as a "clown car." Now we know that term should be reserved for the legal stunt my brothers--Paul J. Shuler (radiology tech at Mercy Hospital) and David N. Shuler (lawyer, Shuler Law Firm)--are trying to pull in Greene County Probate Court. My brothers' nefarious activities make the Donald Trump-led GOP train seem positively quaint and genteel by comparison. At least there is a legitimate reason to have a GOP primary. There is no lawful or factual basis for the "INP and DIS" (incapacitated and disabled) case my brothers have wrought. How do we know? For starters let's look at the Public Administrator page for Greene County, the very jurisdiction where my brothers filed their petition. It's clear that "INP and DIS" proceedings are not for people who have been the victims of bad luck or the targets of bad people (as we have been)-- it's not for folks whose property has been stolen over a 15-year period of time (as ours has been, by corrupt lawyers, judges, and law-enforcement types); it's not for folks who've had their home wiped out by a tornado or flood; it's not for those badly injured in a car crash or other mishap. Do we have schizophrenia or bi-polar disease or anything similar to them? No one has even hinted that we do. Do we have mental retardation or brain injury or any form of dementia? Again, no one has even hinted at that. The above disabilities are not by themselves sufficient reasons to declare someone incompetent. Competency has to do with a person's ability to make an informed decision without the risk of harm that may be experienced as a result of inability to provide for him/herself or manage his/her affairs. Further, a conservator may be appointed when only a physical disability impairs a person's ability to handle his financial affairs. . . .
That Paul and David Shuler have brought such a baseless case should be grounds for sanctions against them. It also should outrage taxpayers who are seeing their funds wasted. Even more alarming is this: Evidence strongly suggests the "INP and DIS" case was filed with an ulterior motive in mind. It has nothing to do with the well-being of Carol and me. It's all about protecting the landlord, sheriff deputies, and lawyers (including my brother, David) who are responsible for our injuries. One sign of that is the court-appointed lawyer who is assigned to "represent our interests." His name is Daniel G. Menzie, a solo practitioner based in Suite 200 of Hammons Tower at 901 E. St. Louis St. in Springfield, MO. Who just happens to be on the 20th floor of Hammons Tower? That would be Lowther Johnson, the law firm that represented landlord Trent Cowherd in our eviction case and allowed the eviction to proceed even though it was unlawfully scheduled inside the 10-day window when no such action could take place--and even though we had filed a Notice of Appeal, which put an automatic stay on the eviction. In other words, Lowther Johnson and Trent Cowherd (not to mention the Greene County Sheriff's Office) have major liability for the injuries Carol and I have suffered--and "our attorney" just happens to be Daniel Menzie, one of Lowther Johnson's office neighbors. On top of that, we have become aware of documentation about the way Mr. Menzie spends some of his extracurricular time, and it calls into question his ethics, taste, and judgment. We will share that information shortly, and it likely will help you understand why we want no part of Mr. Menzie--or the charade he is trying to help my ethically challenged brothers to pull.